First things first: This is a limited time offer for those who sign up for a FREE Amazon Mom service and it ends on 29 Aug 2013. With this offer you have to pay just $2 for a $40 diapers order and valid only in USA. 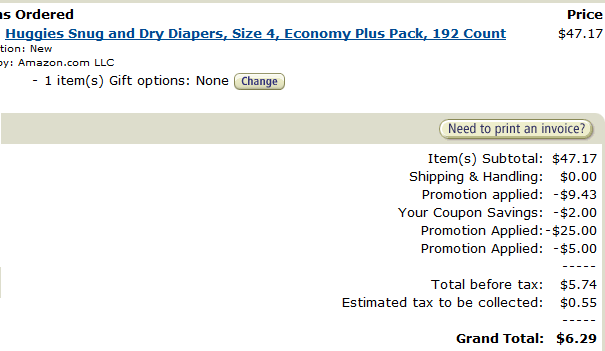 Amazon is running an offer that gives deep discounts on kids diapers. I got a 222 count Pampers diapers for just 2$, which generally costs around 40$. One of my friends paid just $6.5 for a diapers box worth of $47. You can also claim this offer by following these steps. 2. Click here to claim $5 off $25 back to school promotion coupon – This coupons gives you $5 off your $25 purchase on Amazon. All you need to do is to click on the share button to get a 5$ credit to your Amazon account. By the way Amazon posts a message on your Facebook profile and you can delete it if you don’t like. 3. Select Amazon Mom eligible diapers by browsing the list of products available here – there are a wide range of choices from Pampers & Huggies. Make sure that selected product is labeled with “Sold By Amazon”. Deep discounts are applicable only for Amazon sold products. 4. While adding to the cart make sure that you select “Subscribe & Save” to get 20% off. Choose 3 months as your subscription period, we can cancel this along with Amazon Mom subscription at no cost. 5. Head to check out and use the coupon BABYTIME to get $25 discount. 6. Tada!!! All your discounts are added up by now and what you need to pay is just couple of dollars. Check out and enjoy the freebies. By the way, don’t forget to make a note in calendar to cancel Amazon Mom subscription after 2 months.